"The author puts this book in the best possible context by referring to the ""magisterial and paradoxical Dr. Schumpeter"". A figure in a rare class with John Maynard Keynes, Friedrich von Hayek, and Alfred Marshall, the work of Joseph Schumpeter is equalled only in monumental significance by his personal trials and tribulations. The work is divided into two volumes - the first covering his career in Europe and the second his life and achievements in America.Walt Rostow, in his Foreword, sums up Robert Loring Allen's achievement in biography and intellectual history thus: ""In dealing with Schumpeter's life, Allen exhibits a rare consciousness of the extraordinary complexity and only limited penetrability of the human personality Schumpeter's closely interwoven personal and professional life unfolds, Allen develops without dogmatism a pattern of linkages for the reader to contemplate. In a splendid final passage, he provides a memorable summation. ""What makes this enormous effort so successful is the linkage of the personal and the professional, the biographical with the intellectual. Indeed, it is Schumpeter's single-minded determination to explain within a single, formal theory, the dynamics of capitalism that bridges the gap in space, time, and personality. To his books The Theory of Economic Development, and Capitalism, Socialism and Democracy, both published by Transaction, is now added the specific contexts in which these and his other works were written.The author of this biography, like the subject himself, is a masterful student of the craft of economics, and its place within the larger social science contexts that Schumpeter worked. In this work, we are introduced into the main current of European and American social science alike. 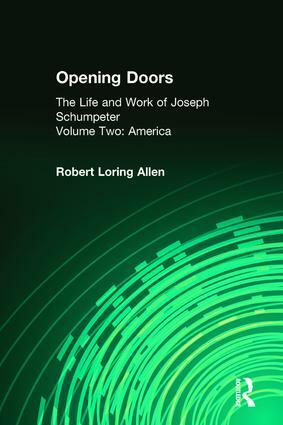 The title of the book, Opening Doors, derives from Schumpeter's life long aim to appeal to inquiring minds to move through such doors in an effort to create the social science of the"